Fixed! barcode symbol rendering for Industrial 2 of 5. Fixed! FNC special chars in barcode Code 128 encoding when explicit switching between Char Sets is used. Improved! Text Justify Alignment for EAN and UPC barcodes. You can download and update the product by using the download link which can be found in the license email or in the Download section of our website. New! Added new WebPrintJobGroup class for printing multiple WebPrintJob objects from ASP.NET! 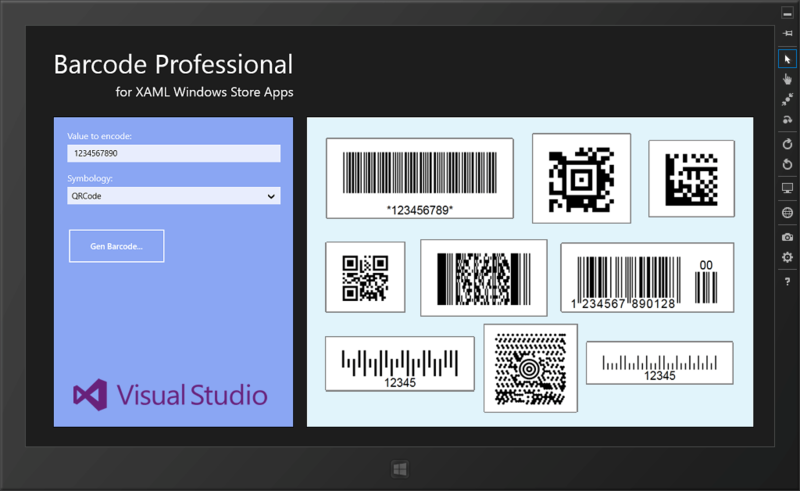 Barcode Professional for XAML WinRT Windows Store Apps just released! Today is great day! We’re proud to announce that our new Barcode Professional for XAML WinRT is now available! You can start using Barcode Professional for XAML WinRT in your Windows Store Apps for adding barcode printing and generation capabilities. Barcode Pro for XAML WinRT can be used within Windows Store Apps developed with VB, C# or C++ in Visual Studio 2012 or the Expression edition for Windows 8! Feel free to contact our experts for any kind of questions on our products. Our team has not stopped since the WebClientPrint product release and this time they are working on porting our first-class Barcode Professional product to the new Windows 8 WinRT API. Neodynamic is the only company specialized in barcode technologies which provides GS1/ISO-IEC/AIM-compliance linear (1D), postal, 2D, stacked and composite barcode symbols to .NET developers and the new Windows Store applications market will need a first-class barcode solution for sure. Let’s say you need to create high quality QR Code to stamp it on gift cards, invoices, etc within your Windows Store app. Or maybe you need to create and print barcode labels within your Windows Store app. Or the business reports need some kind of barcode being there. For any barcode needs you might have when developing your Windows Store apps, you can safely leverage them to Neodynamic’s Barcode Professional for XAML WinRT product. The product will be available shortly so stay tuned! Barcode Professional for Windows Phone just released! Neodynamic is proud to announce the availability of Barcode Professional for Windows Phone; the Best Barcode Solution for Windows Phone Platform. Barcode Professional for Windows Phone is a lightweight .NET assembly (DLL) which generates high quality vector-based barcodes for Silverlight-Windows Phone Applications. Barcode Professional for Windows Phone was designed and written from ground up to take advantage of Microsoft Silverlight for Windows Phone technology allowing software developers to add barcode generation WP mobile applications. Barcode Professional supports most popular Linear (1D) & 2D Symbologies/Standards all-in-one solution including Code 39, Code 128, GS1-128, GS1 DataBar (RSS-14), EAN 13 & UPC, Data Matrix, QR Code, PDF 417, UPS MaxiCode, Micro QR Code, ALL EAN/UPC Composite Barcodes (CC-A, CC-B & CC-C) and many more barcode standards. Barcode Professional is fully integrated to Microsoft Visual Studio 2010 products including Visual Studio 2010 Express for Windows Phone Edition.